Headlamps are great! I have a number of them and keep one in every survival kit. You probably have one or more too as part of your survival or camping gear. There is some good and there is some bad though. And that’s why as part of my gear I have headlamps AND flashlights. They each have their pros and cons. Lets talk about the headlamp. What’s good about it? This is why they were designed! The number one best thing is the ability to have both hands free while illuminating the dark! Pretty obvious, yes? Compared to holding a flashlight in your hand, a headlamp is better for walking or hiking in the dark. Why? Because you now have both hands for balance and support. You definitely need both hands while setting up camp. If that happens to be during the evening, a headlamp saves the day compared to a handheld flashlight. It can be blindly aggravating when someone wearing a headlamp is speaking to you while the light shines in your eyes. Some people are conscious of this and may shut it off out of courtesy. But others don’t. Ouch. Compared to a handheld flashlight, the flashlight held in one’s hand is not at eye level and is easily redirected away from the eyes of whom you are speaking with. You don’t have to shut if off in this case. Tactical flashlights are definitely better in a tactical situation than a headlamp. 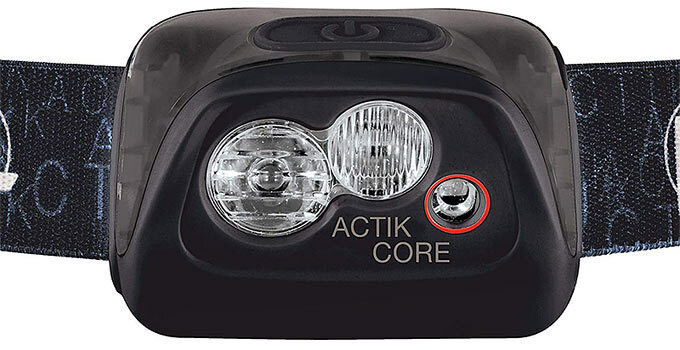 A tactical flashlight will have a rear push-button, momentary on – and other features. The light shining from a headlamp will always follow the direction of your head. Tactically, you want that light in your hands for ultimate directional control. Headlamps today are getting very bright. Plenty bright. However a purpose designed flashlight for high brightness (lumens) are readily available and can be more powerful. A typical headlamp will only hold so much battery weight before being too uncomfortable to wear. A flashlight though can be designed to pack quite a punch with powerful batteries and LED bulbs. Okay, if I only had one choice, I personally would get a headlamp. I use them a lot for a variety of things around the house. Let say that Mrs.J says we need another case of TP from the storage container. It’s evening, getting dark (it figures). I slip on my headlamp for the walk outside down the short path through the evergreens to the container. Holding a case with both hands is no problem for the walk back. A headlamp is great for a survival kit. They don’t take up much space (design dependent) and will serve more functionality if you ever need it. Oh, and tactical lights mounted on a few select firearms. 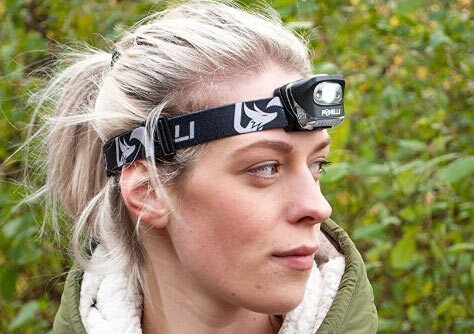 Headlamp Choices & Comparison – Which are Best? I’ve gotta tell you, there are lots of them on the market these days. It can be difficult to critique. Many of them are ‘cheap’ and there are plenty of quality choices too. 1. At least 3 brightness settings. This gives me usability options and choices that affect battery life. 2. Remember the last brightness setting when it turns on – without having to cycle through. 3. Dual beam, Multi beam Flood Lamp AND Spot Lamp for the best of both worlds. Ideally each of them individually select-able on/off with their own buttons. But dual flood/spot functionality is somewhat hard to find. 4. Common batteries (AA or AAA). 5. Adjustable angle tilt. Most are adjustable. But some aren’t. This is a requirement for me. – Red light function. Red helps maintain natural night vision while still lighting up a map or whatever. – Waterproof. Lets face it, chances are it may be used out in weather. Quality headlamps will be up to the task. – Brand name reputation. Some of my headlamps are just cheap ones. Good enough for what they’re designated for. I have two others that I paid lots more for. They are quality and what I most often use. I’ve already had them for (I think) 4 years and they’ve been used quite a lot. Again, there are tons of choices. The good ones that I have (they’re both identical) are the Fenix brand. They don’t make the model I have anymore (typical – there’s usually a new model coming out all the time). What do you find most useful about a headlamp? Preparing ours for tonight JIC, the storm that is going to hit will have winds up to 65MPH. Do not recall the brand we purchased as we have had them for awhile. Handsfree. Hunting, auto repairs, taking out racoons/possums at night that are in the garbage can, snooping the chicken pen. One headlamp for sights, a handheld for glowing, beady eyes. I read earlier that there is three major storms coming your way? Yup. Heard the emergency alert on radio for a blizzard! Have not heard them so often in CA! 3 storms, on the 2nd one now! Nice to see some of these headlamp offerings. Having worn an old style mining ‘cap lamp’ for many years underground (along with the heavy wet cell battery on my belt), the new lightweight head lamps are a real treat. I can tell you that you have to get used to wearing one of these while talking to people. As you mentioned, a lot of people don’t appreciate the light in the eyes. (most underground miners do not talk directly facing you but will tilt his/her head to one side. a light in another miner’s eyes is seen as asking for a fight.) I like my new headlamps for taking the dog on night time walks around the farm. His goes around his neck and has a red-flashing mode so I can see where he is. The LED and COB lights, a couple of sets of rechargeable AA batteries, and we are good for quite a long while with almost next to no maintenance. Been ‘in the dark’ for a long time. LOL. Old miners used to say “your spouse is cheating on you” when your lamp went out underground. Yup, had that happen once too. I had some for camping and it practically ate batteries. Probably a cheap one. Have several headlamps. One is an old incandescent, a little heavy and bulky but still works good (eats batteries though). A couple of led models, but my “go to” is a a cap with two led’s mounted in the bill. It illuminates about 15 ft to the front with enough light to navigate at night, and is bright enough for detail work at arms length. My kids got it for me about 5 years ago, it’s still on it’s first batteries. I love it because you don’t even notice the weight or any bulk. Has on/off switch built in the bill so you don’t have to fumble to find it. To redirect the beam, you just adjust how the cap rests on your head. Very handy to have. Have done the same…wish i’d thought of the tape though! Love these things. First used one several years ago while doing under the house plumbing and foundation work. This is a must have as far as I’m concerned. Came in real handy during erma in florida. Reading about the emp metal can on the other post I would recommend getting several and making a stash. We used the head lamps for everything. Sure we had a geni to power some lights but it was nice to move about the entire home hands free to clean, pickup, read books, play cards. We do have hurricane lamps and candles but it was just more convenient and safer with the head lamp. Way safer than open flames. Hurricane tip: We took empty half gallon milk jugs inserted a cheap single aa cell led flashlight clipped to the opening and handed them out to friends as a light source to replace open flame lanterns and candles in their homes. Grid down non existent cell phone signal, if your home catches on fire you are screwed. Love our headlamps for night walks, personal reading, using both hands for other events. Always handy. Do not recall the brand at the moment….but would not be caught without. keep one in each range bag with extra batteries, several handy near the safes and a few scattered in junk drawers around the ranch. they are great when suturing or generalized medical attention as well, so keep a couple with extra batteries in the EMS bag. Some years back my oldest son went backpacking with his Scout Den and carried with him a headlamp I purchased. They night-trailed down a narrow trail into the Grand Canyon and, because he had two free hands, he completed the trail without an injury/fall, the only Scout to do so. Don’t get me wrong a good flashlight is invaluable but there are times when a headlamp is the best solution. Headlamp is my choice! Used them often when hiking around trying to get back to the vehicle when the DH said we would be back before dark…..
Actually 3! I carry a flashlight, a nice bright multi function headlamp and a hunting ball cap clip head lamp that is just barely bright enough to see the trail in front of you. Stealth is needed at times and night vision is frowned upon by the game rangers round here sooooo…. Remember the red lens is best for keeping the light from being as bright but it makes map reading difficult with military style maps. I like Coast products. You can find the head lamp at Lowes in our area. Ordered Mr. a 600R flashlight and it has a rechargeable battery or can use reg batteries. It is heavy duty coated with a non slip rubber type material. Also comes in bright colors if you want. It is cheaper on Amazon than on the Coast site. Go figure, I saved 16.00 dollars. Nice and bright and I tested the recharge battery life and it was just what the Coast site said. I have a couple of LED lights that clip onto the bill of a ball cap, and a headlamp that I got for free at harbor freight when I bought something, but no serious head lamp. Sounds like I might need to get at least one. So, what are we looking at in the price range of a modest one, in dollars? Anyone….? I have a few LED Headlamps and use them for work, they are handy in a crawlspace or attic. My favorite one is made by LED Lenser. It has 2 switches on the headlamp, one for the white LED’s and one for a red LED. There is a battery case with a brightness lever on it that sits on the back of your head opposite the front light. It goes from almost no light to pretty bright. It runs on 3 AAA batts. I have several headlamps, but this one is the best thought ought design. But then it is toward the higher end of headlamp pricing. I continue to work the PM shift into Noc shift so on an every day basis, I operate by flashlight for 1/2 to 1/4 of my daily routine. I like the fact that the headlamps allow one to wash dishes or hold onto a dog leash with my free hands. I choose rather simple units that have only an on/off switch with a multi-click selector. I purchase the inexpensive units from REI because I have one in my local area. For $60.00 I can buy 3 units and not worry too much about battery leakage killing one. ( I lost several old flashlights, clocks and headlamps to leaking Duracell Batteries when I first moved up here. Now, I no longer use Duracell Batteries.). I keep one pairing in the bedside stand, another pairing in my work daypack and one in the utility room I use when I enter the house from the Garage. Each pairing consists of a Minimag LED using AAA batteries with a Petzal inexpensive/simple to operate headlamp. The other flashlights are specialized units for specific purposes ( like the light/laser attachment on the rail of the bedside handgun.). I have received more complex lights as gifts in the past though I have found I have best luck with a relatively simple units for everyday use. The times I used lights the most were when I lived in a very hot region where I walked my dog at night when she would not burn her feet on the hot pavement during the daytime. The number of times I have had a headlamp crap out on me and die with miles between me and home…I can count on 1 hand. Still, that is when the redundant flashlight on my person paid for itself in spades. Remember the old rule of 1 is none and carry a backup if you travel at night on a habitual basis. I check my batteries for leakage at least 1x per month. I hope this answers your question BigBadCat. I used and traveled by flashlight a lot more when I was a desert rat. ( travel by night to avoid the heat of the day.). We fought fires at night in Southern California for the same reasons. I agree Duracell Batteries are prone to leaking, I’ve had a few things destroyed by them. No more, I now use Panasonic Alkaline from The Dollar Tree, 5-years and no leaks. I keep a headlamp and a carbon filter in a small plastic bag in the bedroom draw and on the coat hooks by the front door for use in case of fire or general emergency . also keep one in my duster (my go to outdoor coat ) this has come in handy when walking home from the pub after a late one many times lol . Headlamps may be the best thing i discovered in the 10 years! Great for camping, and even better for late night dog walks…this time of year, I keep one in my jacket pocket at all times, although I must admit, I get so used to having it on that weekends it isn’t unusual for it to be on all day long! I’d love to have a wrist light, like SF uses, but they sure are proud of them. We have flashlights everywhere. I carry a small flashlight in my pocket all the time. It has the clip that will hold it on a cap. I have a head light that O’Reilly auto parts gave me for Christmas. I use it often. There are flashlights next to our recliners and in each vehicle. I keep a wind up light in each bag and in the truck. It always seems like batteries in a flashlight will be dead by the time I need them in the truck. Something else that’s kind of cool is the ball cap with LED lights in the bill of the cap. Available in spot or flood light. Wrist lights are handy and can be made by use of tape and bandanas. A roll of tape be it duct tape or fiberglass filament tape is a handy thing to tuck into a go bag because small lights can be taped to bicycle helmets and/or hard hats as well. Along with lights on your person, If you are walking alongside or near a road, you may want to consider placing 2×2 inch squares of reflective tape along your back and shoulders such that cars can see you after dark. I have worked around traffic long enough where my visibility to oncoming traffic is always a consideration. Part of survival is staying safe out there.